Healthy Strawberry Rhubarb Crisp. We are in the middle of berry season here. I am also starting to see rhubarb showing up in the grocery stores. I have had numerous requests to do some more strawberry rhubarb recipes. Currently, the only strawberry rhubarb recipe I have is my strawberry rhubarb sorbet. Well now I can add a healthy and vegan strawberry rhubarb crisp to the list. 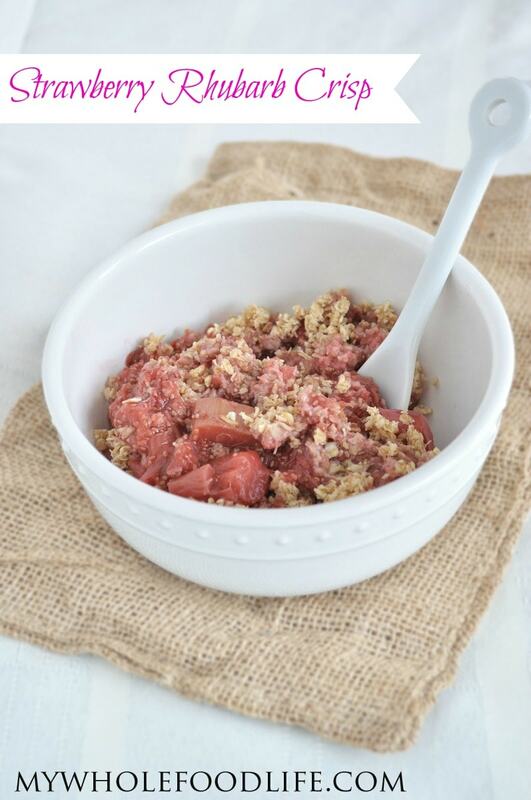 This healthiesr strawberry rhubarb crisp is not only made healthier, it is also delicious! I will even go as far as to say this strawberry rhubarb crisp recipe is healthy enough for breakfast! If you like strawberry desserts, you may also like my Strawberry Creme Truffles. This strawberry rhubarb crisp is vegan and gluten free, but I will also include a grain free option in the recipe instructions. 🙂 I used chia seeds to gel up the filling and I must say the taste and texture is awesome. I had to stop myself from eating too much at once. My strawberry rhubarb crisp has a sweet, but tart taste. I like that, but if you like things even sweeter, I suggest trying the fruit mixture before putting it in the oven. You can always add some extra maple syrup if you like. A healthier version of the classic dessert! In medium sized saucepan , add the sliced strawberries, sliced rhubarb, water, maple syrup, lemon juice, lemon zest and sea salt. Bring to a boil and then turn down to medium and simmer, stirring occasionally, until the rhubarb looks softened. Mine took about 10 minutes. Once that mixture is softened, add the chia seeds and stir well. Take a taste. If it's too tart for you, you can always add a little more maple syrup. Set aside for 15-20 minutes. In a food processor , combine all the crumble topping ingredients and pulse a couple times until everything comes together. Add the fruit mixture to a greased baking dish. I used an 8x8 glass dish . Sprinkle the crumble topping on top of the fruit. Bake for about 10-15 minutes or until the topping looks golden in color. Store this strawberry rhubarb crisp in the fridge. It should keep for at least a week. I highly suggest warming it up and adding a little ice cream. I think it would be awesome with my strawberry ice cream . Enjoy! I've got to try rhubarb this season! I always tell myself that, but never do. This looks delish and I love the simplicity of the ingredients! Thanks Kim! I hope you enjoy it! Ooo I love rhubarb, this looks delicious. I usually just end up having it on it's own, I might treat myself to this instead! This looks amazing. I love the wholesome ingredients in this and look forward to trying it out - will put the rhubarb growing in my backyard to good use! Thank you so much for the recipe! You are so welcome Heather! I hope you enjoy the recipe! A friend of mine just gave me some fresh rhubarb from her garden! I really like the idea of the chia seeds. Thanks for sharing this recipe. The pics are great. Thank you! I loved the texture the chia seeds gave it! Do you write the majority of your own blog comments? They seem very canned. I am not sure what you mean, but I do personally write every single comment. I have no helpers. Can you use honey instead of maple syrup. I'm at the end of my bottle of maple syrup but I have everything else! Yes you can. I hope you enjoy the recipe! Just made this! Have yet to try it, but looks and smells amazing. I made the topping with almond meal, and added 1/4 cup of hemp hearts! Breakfast for a week :) Great recipe! I have never made a crisp by simmering the fruit beforehand. I LOVE the chia as a thickener. Thanks Kendall! I hope you enjoy it. Hemp hearts are a great addition! Thanks for the recipe. I tried it last night but I think the proportion for the chia seeds might be off. Online it says 2T of Chia seeds but on the preview ingredients on Pinterest it says 2 tsp. 2T seemed like a lot so I used one and even that seemed like too much. Otherwise good recipe without the sugar. I did use 2 tablespoons. Not sure why Pinterest didn't see it that way. I just made this tonight and it is awesome!! Thank you so much for all the wonderful recipes! So glad you like it Anna! Thank you for making my recipes! Hi! This looks great! Awesome since its gluten free. I don't have any chia seeds so can I just use eggs? How many? Are you asking to use eggs in place of chia seeds? I am not sure that will work.